One of the main factors that motivated us to return from here is the healthcare system. There are long waiting times for doctor's appointments. And many times new patients are mercilessly rejected.When one is young and in the prime of health it is easier to tackle the system, but at the stage where the middle-aged body is experiencing pains, it doesn't make sense to go around visiting multiple doctors and getting a waiting period of 1 to 6 months. For even the simple eye checkup there's a six month wait and the baby would be born before one gets to the gynecologist. Of course , a private insurance would put you ahead in the waiting list. Money matters !! 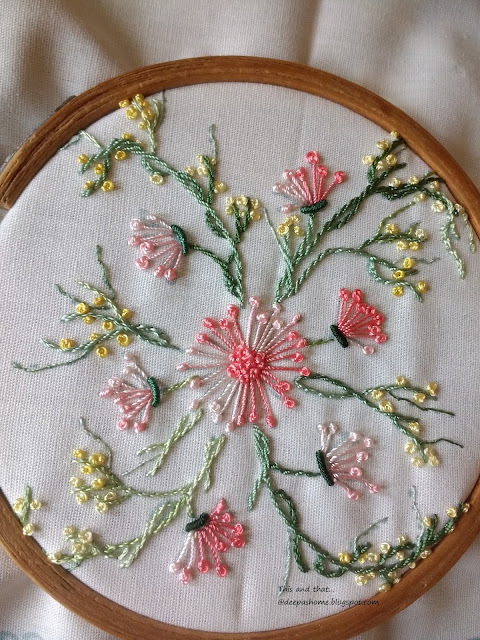 Anyway, in between all this, I finished a simple pattern from JDR which had been with me for a long time.It called for Pistil stitch or long tailed french knot or lavangam stitch as known in some parts of India. Below is the pic of my fake pistil stitch flower. It is not a very neatly stitched one, but I think you'll get the idea. I just made french knots all around and then inserted straight stitches from the center into the knots. This way one doesn't need to bother about all that keeping the tail taut while inserting the needle into the cloth. You can use this method if you're not comfortable with the regular Pistil stitch. 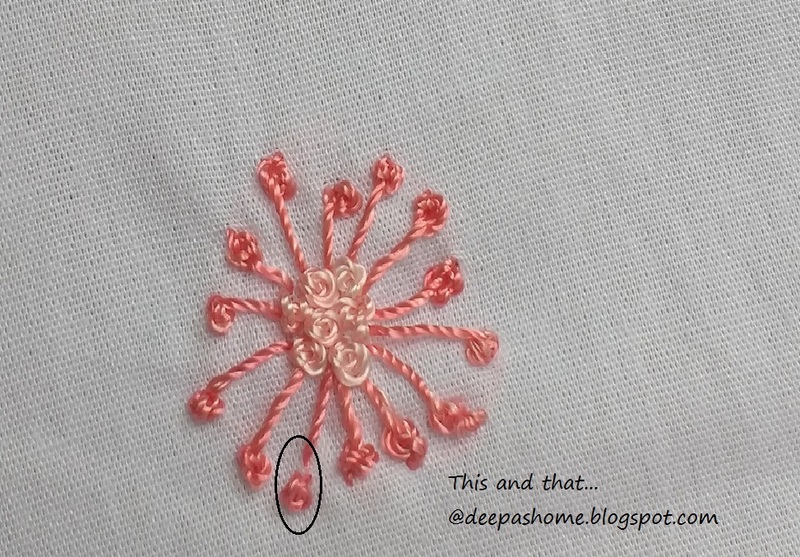 Alternately,you can also stitch a line and then make a french knot on top of the line very close to the tip. But it will not be an exact replica of Pistil stitch. In the picture the petal marked with oval is stitched in the second manner. But the placement of french knot in this case should be exactly at the tip, unlike mine which is slightly afar. That is a smart way to 'fake' the Pistil Stitch, which IS a tricky one. How unfortunate to get the flu right at the end of your stay in Germany. I hope you get better soon. I understand how frustrating the healthcare system is when you can't get the help you need WHEN you need it! I hope all will be sunny and healthy when you return to India. So sorry you succumbed to the dreaded plague! It's particularly nasty this year too, but hopefully you got the milder version. You sound so happy to move back to India so hopefully all will go smoothly. Will you be moving back to the where you lived before or must you find a new place? ps - meant to say that I like the fake pistil stitch!! That's a neat, and very convincing, fake! Great idea, Deepa! The stitching in the hoop is beautiful. I missed your previous post so the news that you are going back was a surprise to me. Since you had no opportunity of visiting me in Florence, I will have to come to Bangalore! I hope you are on the mend. I’ve succumbed to a nasty bout of something in our final weeks here too. I’m sorry to hear the German healthcare system is as bad as the British. On thing I’m looking forward to is not only the ease of which to get an appointment, but also the knowledge that when I do get in they will be appropriately qualified rather than relying on Wikipedia! Regardless, that is a great way to fake pistil stitch - only you will know! Isn’t it funny about some stitches - I wouldn’t give a second thought to stitching pistil stitches, and other have a dreadful time with them! good luck for the move. been there and don't envy you, but you're resilient! boo for the german health care. Hope you're all feeling better. I was surprised to read this as I thought Germany had a good health care system. I LOVE your pistal stitch flowers, so pretty!